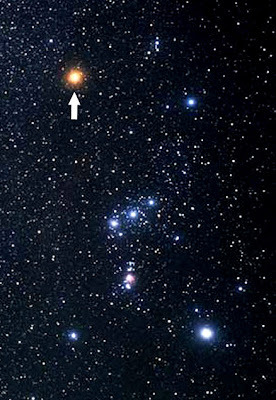 Betelgeuse in the Orion constellation. Betelgeuse, also known as Alpha Orionis, is the second-brightest star in the constellation of Orion. Betelgeuse could have a shock in store for us sometime in the next million years. It is classified as a red supergiant star, meaning that it’s enormous and very unstable. If it were our sun, it would extend out to the orbit of Jupiter. Betelgeuse is about to explode as a type II supernova. When it does it will shine like a second sun in our sky because it is relatively close, only 640 light years away. A star that goes supernova is one of the most-violent events in the cosmos and can briefly outshine a whole galaxy. When a red giant has reached the end of its life and used up nearly all of its fuel, it can no longer counter gravity’s pull with heat pressure from it’s core. By this time, the core has fused hydrogen into helium, helium into carbon, carbon into oxygen, oxygen into neon, neon into silicon, and silicon into iron. Fusion stops with iron because it is so stable that no more energy can be achieved by fusing it. By now the core is losing its desperate fight against gravitational collapse. Fusion of silicon into iron only takes about two weeks. When it runs out, the core collapses immediately and in less than a second it reaches the density of an atomic nucleus. This is like driving into a brick wall and bouncing off. The core rebounds and recollapses over and over, and the shockwave heats up the rest of the star to temperatures in the range of millions to billions of degrees. The outer layers of the star is blown away at speeds approaching 30,000 km/s, or 1/10th the speed of light. The total energy created is about 100 times more than the total energy our sun will produce in its 10 billion year lifespan, all within a few seconds. If it happened in our lifetime It would be one of the most-spectacular astronomical events ever. It is through the violence of a supernova explosion that elements heavier than iron are forged. That is because there is no net-energy gain when heavier elements fuse—they can’t be created in the hearts of stars. So the gold from your jewelry was formed by a supernova, then spread into space in the expanding shell of the supernova remnant where it mixed with other material in the Milky Way and this became the raw material for the next generation of stars and planets, including our own solar system. Betelgeuse is easy to spot in the night sky, as part of the famous constellation Orion and because of its distinctive orange-red color. In the Northern Hemisphere it can be seen rising in the east just after sunset during winter. By mid-March, Betelgeuse can be seen in the southern sky at night and is visible to virtually all the inhabited parts of the globe. The next time you are out stargazing, look for this amazing star—maybe it will put on the show of a lifetime for us some day.